Oprah Winfrey breaking new ground and heading face-first into the 21st Century has opened up the flood gates for Twitter's mass market appeal. Now everyone is free to get in on what used to be the Internets best kept secret. 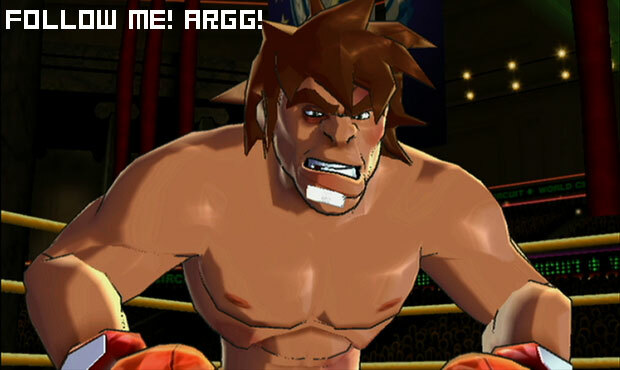 Case in point: Nintendo's upcoming Wii game Punch-Out!! now has its own Twitter account, WVBABoxing. Go on and follow it; it needs friends. Why would you do that? Because you might get some Twitter-exclusive Punch-Out!! goodies, like a few new multiplayer screenshots like the one seen above. At the time of this writing, WVBABoxing has few followers. According to Twitter analysis Web site Twanalyst, WVBABoxing has a "likeable sociopatic vain" personality, has a chatty and coherent style, and is a sharer. And sharing is caring.